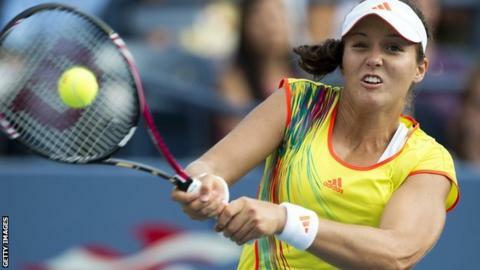 Britain's Laura Robson has been handed the WTA's newcomer of the year award for her performances in 2012. Robson won silver at London 2012 in the mixed doubles alongside Andy Murray and reached the US Open fourth round after wins over Kim Clijsters and Li Na. The 18-year-old also became the first Briton to reach a WTA final in 22 years when she lost the Guangzhou decider to Su-Wei Hsieh in September. "It's a huge honour to have won the award," said Robson. Robson is the first Briton to win a WTA award since Virginia Wade was named player of the year in 1977. Former winners of the newcomer award include Clijsters, Maria Sharapova, Venus and Serena Williams, Martina Hingis and Jennifer Capriati. "I looked at the list of past winners and it's certainly a very impressive line-up that includes many of my idols growing up," added Robson. "I hope that I can go on to achieve close to what many of the past winners have achieved in their careers." Robson began the year ranked 131st before rising to 53rd, four places below compatriot Heather Watson who was also in the running for the prize. The 20-year-old bettered Robson by winning the Japan Open in October - the first British woman to win a WTA title since Sara Gomer in 1988.